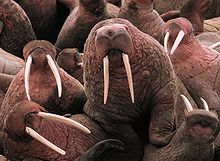 From Middle English tusk (also tux, tusch), from Old English tūx, tūsc (“grinder, canine tooth, tusk”), from Proto-Germanic *tunþskaz (“tooth”), extended form of Proto-Germanic *tanþs (“tooth”), from Proto-Indo-European *h₃dónts (“tooth”). Cognate with Saterland Frisian Tusk (“tooth”), West Frisian tosk (“tooth”), Icelandic toskur (“a tusk, tooth”) (whence the Old Norse and Icelandic Ratatoskr and Ratatoskur respectively), Gothic 𐍄𐌿𐌽𐌸𐌿𐍃 (tunþus, “tooth”) and *𐍄𐌿𐌽𐌳𐌹 (*tundi, “thorn, tooth”). More at tooth. “tusk” in Douglas Harper, Online Etymology Dictionary , 2001–2019. Related to Finnish tuska. Ultimately from Russian тоска́ (toská, “melancholy”). From Old English tūx, from earlier tūsc, from Proto-Germanic *tunþskaz. Compare tusshe. Any long and sharp tooth. (rare) The end of a spear. “tusk (n.(1))” in MED Online , Ann Arbor, Mich.: University of Michigan, 2007, retrieved 2018-07-22. Cognate with Old English tūsc. This page was last edited on 6 April 2019, at 15:48.